Commitment. If there's a word that can be used to describe the astonishingly powerful work of Asghar Farhadi it would be commitment. From About Elly to A Separation to The Past, Farhadi has committed himself fully to exploring how tiny, ordinary details can snowball out of control. 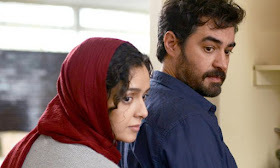 With his latest, The Salesman, the focus continues to be on how these minute aspects can rip apart a relationship, and while Farhadi gets terrific performances from his cast once again, certain choices he makes keeps them frustratingly at a distance. In a brilliant, chaotic opening sequence, the apartment building housing Emad and his wife Rana (Shahab Hosseini and Taraneh Alidoosti) begins to crumble due to nearby construction. As the tenants flee, cracks begin to form within the foundation, the walls rattle. Emad selflessly helps those who can not escape on their own. It's as dramatic a sequence as the typically-reserved Farhadi has ever done, but it's there for a reason, perfectly establishing the tone and teasing the personal fractures that are to come. After that disaster, Emad and Rana take up residence in an apartment suggested to them by Babak (Babak Karimi), a member of their theater troupe. Together they are in the middle of a production of Arthur Miller's "Death of a Salesman". During the day Emad is a teacher, and a popular one who isn't afraid to share details of his personal life with the students. The first cracks begin to form upon moving in, where the previous tenant has left a roomful of her belongings behind. For days and weeks she promises the landlord she'll come get them, but frustration mounts as she refuses to show up. While she's never seen, it's almost like this undependable tenant looms over the home, darkening the mood. It adds all the more weight to what happens next, when Rana casually buzzes someone in after hearing the intercom. Thinking it to be her husband, she leaves the door cracked open, only to be attacked by an unknown assailant. While we see little of the assault, we can sense the personal nature of the violation. We don't know what happened in that bathroom when Rana was attacked, and her fuzziness on the whole situation sends Emad into a tailspin. He begins a tireless search for her attacker, accusing just about anyone he encounters and making suspects out of those he doesn't. On the one hand his quest could be seen as a logical response due to a man's sense of duty to protect their family. And if it were only about that then we could look at this as a revenge movie. But it isn't; there's shame and humiliation within him, as well. What REALLY brought that man up to their apartment that night? He never asks Rana outright, but he doesn't have to. Why is Rana refusing to go to the police and report the incident? Emad repeatedly ignores her wishes to let the whole thing go in order to continue his own selfish pursuits. It's in this casual disregard for the wishes of women, and the complete misunderstanding of women by men, that is where the film finds greatest purchase. What's frustrating about it is Farhadi's reliance on Emad's perspective, pushing Rana into the background. His refusal to explore her feelings probably wasn't an intentional slight but it's a slight nonetheless, especially since her perspective would have been the most interesting one. Instead, Farhadi focuses on this shallow comparison between Emad and 'Salesman' husband Willy Loman, both dealing with issues of inadequacy. The use of the play as a figurative backdrop works effectively in giving the film a theatrical feel, which only helps up the stakes in the tense final moments, set within the cracked walls of their old home. There, Farhadi makes his firmest statement on the trivialization of women by men, usually to their own ruination. By focusing so much on Emad rather than Rana, Farhadi's The Salesman makes that point all the more clear.